Abiodun Akinlade, the preferred candidate of Ibikunle Amosun, governor of Ogun state, for the 2019 governorship election in the state, has defected from the ruling All Progressives Congress (APC) to the Allied People’s Movement (APM). The defection of Akinlade, who represents Egbado south and Ipokia federal constituency of Ogun, was announced at the house of representatives on Thursday. Three other members of the lower legislative chamber moved to other parties. They are Rabiu Kaugama from Jigawa who moved from the Peoples Democratic Party (PDP) to the Social Democratic Party (SDP), Salisu Koko from Kebbi who also joined APC but from SDP and Mohammed Ajanah from Kogi who defected from APC to PDP. Akinlade had lost the governorship ticket of the APC to Dapo Abiodun despite all efforts put in place by Amosun to make him secure it. 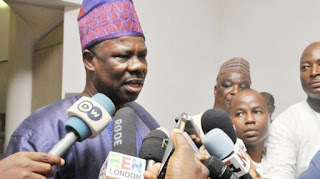 Following the controversies which trailed the primaries, Amosun had said he was under pressure to leave the ruling party. However, he pledged loyalty to President Muhammadu Buhari, promising to work for his re-election. He later lampooned the leadership of the ruling party and vowed to hand over to Akinlade in 2019. Apparently as a result of the crisis in the party, Amosun was the only south-west governor absent when Isiaka Oyetola was sworn in as governor of Osun state on Tuesday. Akinlade’s defection comes two days after Rochas Okorocha, governor of Imo state, who lost out in his bid to secure APC governorship ticket for Uche Nwosu, his preferred candidate, said he would not stop Nwosu from joining another party.